More than 300 paddlers of all levels took part in the 2nd Annual Bay Bridge Paddle on Saturday, cementing this regional event as a bucket list race and reminding us exactly why our sport is so great to begin with. 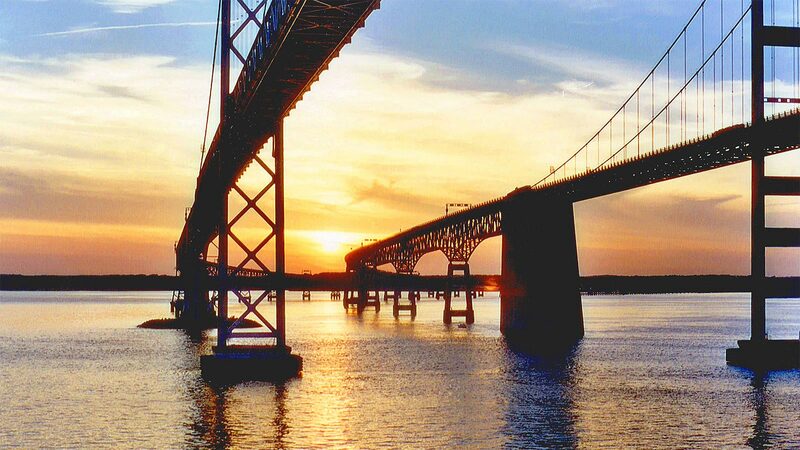 “Bay Bridge” refers to the mighty Chesapeake Bay Bridge, a dual-span formation that stretches more than 4 miles (close to 7kms) across the largest estuary in the United States. To say the it’s an imposing structure would be an understatement. With the unique opportunity to paddle between the two giant spans that dissect this massive waterway, the Bay Bridge Paddle has quickly become a must-do event, drawing in paddlers from all over the East Coast and even a few from around the world. The prize purse is small, the fuss is minimal and the hype is non-existent, but judging by the sheer number of paddlers on the water and smiles at the finish line, the Bay Bridge Paddle is making an impact on our sport far greater in size than its humble gravity would suggest. I was lucky enough to spend the past week in Maryland with crew from Capital SUP and be part of this year’s race, and everything I saw about the event impressed me. From the level of organisational detail on land to the raw challenge on the water to the all-round stoke and positive vibes, the Bay Bridge Paddle gets high marks on virtually every criteria. And although organisers were forced into a last minute course change after an overnight storm whipped up a few too many bumps in the far reaches of the Bay, we still got to paddle beneath the main span of the bridge (through washing machine-like conditions, no less) and marvel at this feat of modern engineering. The course change ended up being a blessing in disguise though, with the 9-mile race turning into a giant, three-lap triangle course that provided plenty of room for strategy and more than a few chances to milk the leftover bumps and pull away from the trains. After a flying start off the beach, the pace soon settled down as visiting international Kelly Margetts – fresh off a 7th-place finish at Carolina and on the last leg of his month-long ‘Sunova Tour‘ – took control up front along with defending champ and three-time Olympian Tommy Buday Jr. from Canada. The elite race would stay that way until the end, with the Aussie showing his class and pulling clear to win by nearly three minutes. Tommy had to settle for the second step on the podium this year, though he was still well clear of the peleton and showed once again why crossover athletes are so dangerous in our sport. Coming home third was the under rated Ron Gossard from Ocean City, who snagged the golden buoy money shot ahead of Kelly (and yours truly) before paddling through for a strong podium finish. 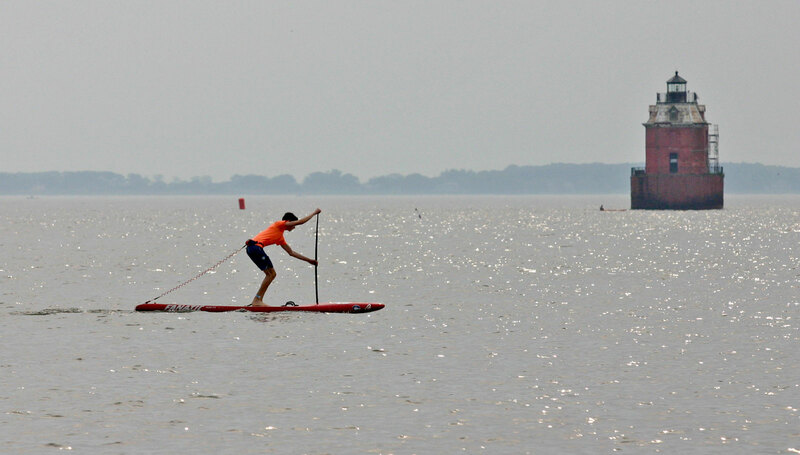 Outside the podium was the official new local dark horse Fielding Pagel (pictured below), who did the sizable Capital SUP contingent proud with his 4th-place finish just ahead of fellow NSP rider and Boston’s most famous paddling export, Jeramie Vaine. In the women’s race it was all April Zilg, with the Wrightsville Beach local – an unsung hero of this year’s Carolina Cup – paddling strong once again to finish in a time of 2 hours 6 minutes, just 13 minutes off the pace of Kelly and almost good enough to be top 10 in the men’s field. Hometown heroes Mary Howser and Lindsay Cook finished 2-3 in a double podium result for the Capital SUP team. My own race was highlighted by a distinct lack of race training in recent months, however I was kept in a semi-respectable position on the results sheet thanks to my board: The 14ft Ocean Faast Pro model from Sunova, which was picking up barely-visible bumps and milking them dry to keep me ahead of some paddlers that I had no right beating. Once again the ‘dugout’ style board, which Brian Szymanski pioneered way back in 2008, is proving to be the design of choice in uneven conditions. In addition to Sunova, the dugout models from ONE, NSP and Starboard also performed well. I would later discover the advertised 9 miles had ballooned out to 11.5 (18.5 kms), which made me feel slightly better about feeling so exhausted on the last lap. It also happened to be a beautiful, sunny, 32-degree (89°F) day in Maryland on Saturday, which made for a ridiculously draining but also quite rewarding morning on the water. Despite being unable to lift my arms above my shoulders on Sunday, this race was actually a lot of fun. There were just enough bumps on offer to keep it interesting, not to mention the incredible experience of paddling beneath the Bay Bridge itself. But most of all it was just a great, positive event to be in the middle of. Not surprisingly, the real story came outside of the elite race, where only 50 of the approximately 260 stand up paddlers were actually racing (there was also another 80 odd kayak, surf ski and outrigger paddlers in the event). The biggest field by far was in the 5K Open Race where over 150 paddlers raced around a 3 mile loop. That included 15-year-old local lad Jack Ballard, below, who absolutely blitzed the field to win by a wide margin and give us a glimpse of the potential future paddling talent in this part of the world. Everyone that crossed the line was made to feel like a champion – we literally all got a medal as we finished – but the biggest cheer of the day was reserved for masters competitor Cindy Eisele, who completed the 18k race in a grueling time of 3 hours 27 minutes, and in doing so highlighted that our sport is just as much about the weekend warriors as it is the pros. 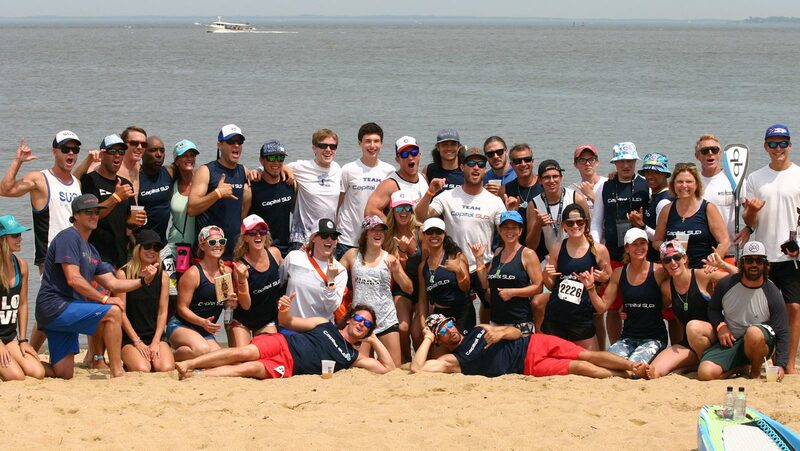 So a big thank you to race director Shendon Grove and his team for pulling off a great event, as well as to every paddler and supporter that helped make it such a fun day at the beach. Though my biggest thank you goes to the team from Capital SUP for looking after us all week and showing us such a good time in Maryland. Capital SUP is a ‘part-business, part-lifestyle’ group that have built up one of the most impressive paddling operations I’ve ever seen. Sure, there are squads in California and Australia with more top guns, but for sheer stoke, enthusiasm and getting new paddlers on the water this crew is hard to match. The fact that Capital SUP has built their entourage in Annapolis, Maryland – not exactly the first place that springs to mind when you think of paddling – makes it even more impressive. We made camp for the week in the ‘Paddle Palace’ right on the water above Capital SUP’s original paddle board rental location (they’ll soon open their fourth location), where we discovered what really makes this crew so successful, and what other paddling communities/businesses/events should take note of: These guys and girls knows how to have as much fun off the water as they do on it, as evidenced by our post-race bar crawl through downtown Annapolis on Saturday night that ended in a festive display of what can only be described as “Riding The Panda” by race winner Kelly Margetts. Fun times in Maryland for sure. Follow the Bay Bridge Paddle, Capital SUP and Sunrise SUP on Facebook for more photos, and add the 2018 Bay Bridge Paddle to your bucket list.